A duel with just the wind! Each student will try and beat their opponent using only one of the four major elements… namely air. 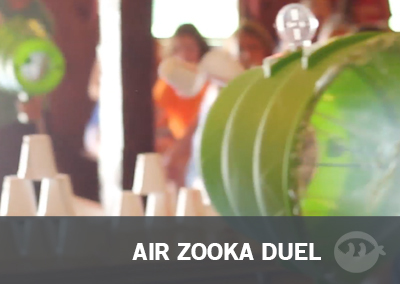 After all, who wouldn’t want to be a part of an Air Zooka Duel! 2. Styrofoam Cups. You will need 15 for each team but keep some extra on hand! Set up your table with a stack of 15 Styrofoam cups! This is a base of 5 cups. Make the cups so you know which cups represent what team. We just ran a sharpie down the cups in two different colors. Take out your line that the students must stand behind when using the Air Zooka’s! Each Student will have an “air kazoom” on either side of a card table, where, there is a perfect stack of styrofoam cups in a pyramid. Be sure the cups are marked to represent each team. The two pyramids next to each other should be side by side, not in front of one another. Basically you want the shooter to be able to see both pyramids at the same time (look to video for visual). When the game begins they have 30 seconds to shoot off the cups. Whatever team knocks all the cups off first, or whoever has the most at the end of the time, will be the winner.